Exams always bring a mixture of emotions. We have just finished our end of tests and the footfall into the health centre to use the support system we have in place increased. I always tell the Health Centre staff that they are a victim of their own success, with the increase in pupils showing the approachability of the staff and how students are using the system we have in place. However you can’t ignore the fact that students are talking more about anxious feelings and the pressure when taking exams. Perhaps rightly so, but this isn’t a piece about the need for a little stress to get the best out of students. What I really want to think about, is it really any different from any other year? Perhaps the only way to consider this is to ask student who/what is putting this pressure on the students? TEACHERS: Do teachers feel they have to get better grades out of the students? Surely this has been the same every year but Data tracking is a hot topic in many schools at the moment. Do teachers feel that students grades are a visible and open reflection on their teaching and therefore changes the purpose of the results. A small test which previously would have only have gone on a report to parents are now open for every other staff member to see and comparable with other teachers in the department. In fact they often form the basis of department reviews. SOCIAL MEDIA: Does social media influence the words or thought of the students? I am all for raising the awareness of Mental Health but I am concerned that many students are now self diagnosing how they are feeling. Several years ago, I don’t think many students would have mentioned the word anxiety. Now I seem to get a new student with social anxiety every week. They can’t go into assembly or be asked a question in class. When I ask what the doctor has suggest to help, I often get a blank stare and they seem surprised with my suggestion that they should seek support and help. Teachers are just that, teachers, not Mental Health experts. Many of us have done the mental health first aid training and know what signs to look out for and how to support students but we should still be guided by the experts. If a student is suffering from anxiety, we need input on how to encourage the student to cope and achieve their potential. PARENTS: they are sometimes the suggestion from pupils the biggest cause of stress and this is a challenge one to address. Have parents expectations changed? Perhaps social media has an influence here. Parents are on Facebook and Twitter and could be under the same pressure that students……. To achieve, to have successful, busy children. How can we support and help parents? We can send helpful leaflets and booklets for them to read, invite them to information evenings and guide when an issue arises. 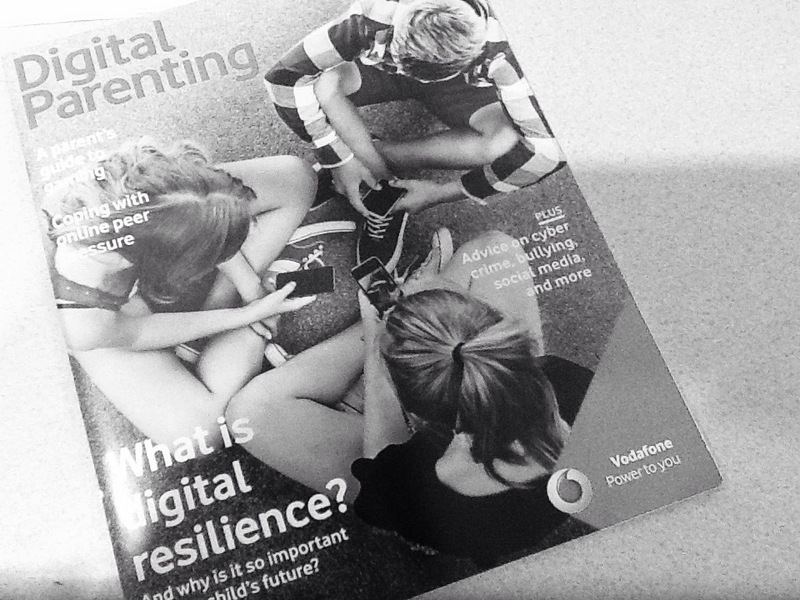 Like the excellent Digital parenting guide in the photo. Listening to parents and reassuring them seems to be the most successful approach many schools have found but this can take time and is challenging if a large school. Reviewing these three points, I am not convinced that there is more stress, but there seems to be a different stress and this can mean that we don’t address the issue or unaware of how to address it. Keeping a yearly overview of the pastoral topics that staff are having to deal with can help. For example the last three years in October, my yr 9 boys seem to have issues with understanding the different between banter and bullying. We now preempt this and do proactive assemblies. Or in May we have noticed that we have a rise in eating issues in the sixth form, it could be the 6th form ball diet or the stress of exams. Again we are being proactive and trying to raise communication before that time of year. And it seems to works, well my numbers or issues are reduced. So what else can we do to help manage the stress? Include it in PSHE lessons, giving coping mechanism and good revision techniques. This seems to be a recurring theme in my blogs. The importance of PSHE cannot be ignored. Open communication with parents so they are aware of the importance ( or lack ) of tests. Support staff with communication and department self review. Make parents aware that we as a school will be guided by professionals on how to support children. Have pastoral issues ( including stress and mental health) as fixed agenda points on staff meetings. Of course there are those students who you are watching out for, who you are worried about the stress that you think they are going through but who surprise you with their response. For example I had one student who for a year saw the school counsellor but then the first day of the exams she decided that she wasn’t going to see the counsellor until sept, so that she could concentrate on exams! Or another student who attendance was atrocious throughout the year because of anxiety and lack of coping mechanism but then didn’t miss one exam and said they enjoyed the structure and discipline needed for exams. This just shows that everyone child, year group, parent and situation is different and every school is different, so one size doesn’t fit all. Perhaps just being aware that stress can effect people and discussing it as an SLT is the starting point we all need.